Jack of many trades Steve Gray (audiobook producer/narrator, tattoo artist, writer, aspiring filmmaker) recently invited me to take part in the debut of his new pod/vid cast “The Rock ‘n Roll, Horror Movies, and Tattoos Show.” During our talk, I delve a lot into The House on Creep Street and a little about The End of Summer, and I share details on the next book in the “Fright Friends Adventures” series Beware the Monstrous Manther! Pretty cool that I share some running time with Danny Hicks, an actor likely most famously known for playing hillbilly Jake in Evil Dead 2: Dead by Dawn. It was a good talk and Steve’s a good guy, so have a listen. 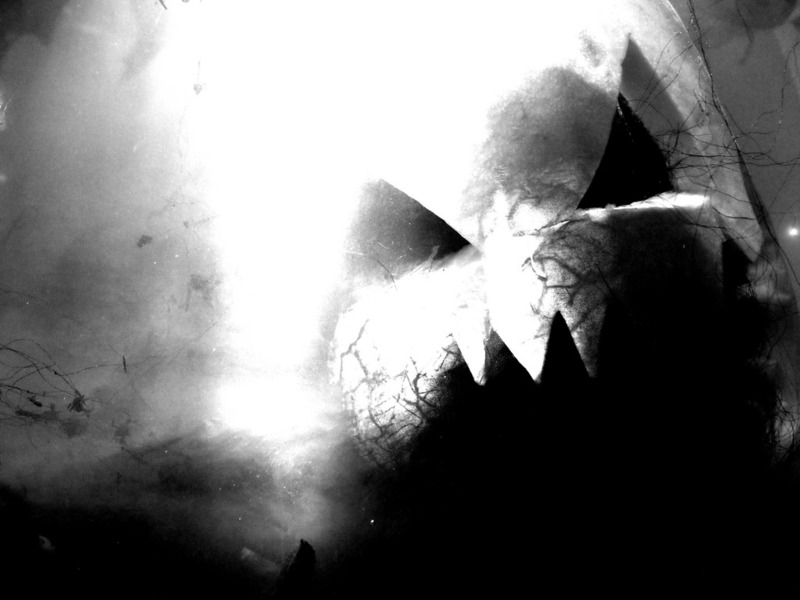 The Halloween anthology has become a large part of my yearly October traditions – whether decades old or hot off the press, I’m always eager to snap up a “new” one and give it a read. These days it’s easier than ever to slap together an anthology, upload it to CreateSpace or whatever self-publishing medium, and unleash it onto the world. Amazon is dripping with e-books available for free download offered by hopeful authors, and like anything else that becomes saturated to that extent, it becomes difficult to find the truly special collections. And here we have Halloween: Magic, Mystery and the Macabre, edited by Paula Guran. The cover sports names that I certainly recognize, but most of them do not ring a bell. I did enjoy Guran’s previous collection, simply titled Halloween, for the most part, and she was kind enough to lend me a copy of her second anthology to read and present as part of my October celebration. Eighteen stories make-up this collection, and as I’ve mentioned before, anthologies by nature are a Rorschach test. For those of a less critical mind, I suppose it’s easier to find an anthology in which every story enthralls and entertains, but frankly, it’s tough to put out such a collection with different authors taking different directions that still manages to please everyone. That’s the beauty of the individual. Norman Partridge is an author with whom I am well familiar, as his novel, Dark Harvest, is frankly one of my favorites. (Read all about that one here.) His contribution here is hands-down one of – if not the – best in the collection. A story that begins with two brothers setting out for an innocent night of trick-or-treating and encountering a local kid named Charlie Steiner, who may very well have lost a little bit of his mind and perfected his mummy costume to the extent that he ordered water scum from the River Nile and cut off his own tongue. When the boys cross paths with this mummy, the story is legitimately eerie and upsetting—and it packs a rather hurtful revelation. Partridge is great with details, insofar as making each minor thing such as the moon or darkness seem alive and contain motive. He writes his story with such a realistic approach that it honest-to-gosh feels like it happened to him. At one point he even says something to the effect of, “Google it and see for yourself,” which I fully admit to doing. The first part of “The Mummy’s Heart” seems like nothing more than haunted childhood recollection. You nearly expect it to end once the faux ending occurs, but there’s much more to this story – so much that it goes from a pulpy monster story to something much more haunting and heartbreaking. “The Mummy’s Heart” plays around with this idea of becoming someone else on Halloween night with the aid of a mask and costume, but what it really seems to be about is being driven to insanity by the idea that one is not happy with the person they are and wishes to become someone/thing else – and will do nearly anything to make that transition happen. And that’s just for the “villain.” It also plays around with refusal to recognize reality for what it is – to be haunted by dreams much more than nightmares. It’s the reason I continue to celebrate Partridge the author as years go by. He so easily writes about human emotion and longing that frankly it doesn’t matter what kind of ghastly device he’s using to frame his story – it’s always about much more. Laird Barron continues this theme of love lost and found with a tale in which a young(?) couple meet on a blind date in a restaurant. They embark on witty banter and attempt fact-finding missions about each other – the usual first-date kind of stuff. But here’s the thing: Is she, in actuality, dead? Is he? Both, or neither? 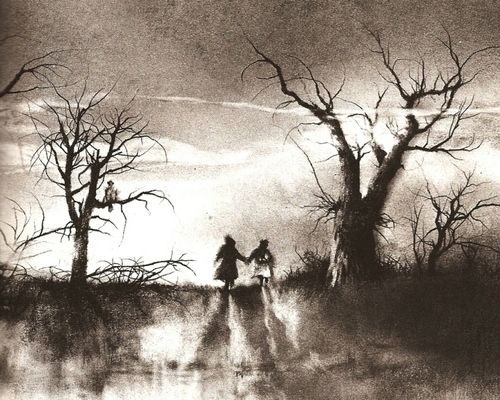 Under the All Hallow’s sky, these two lost souls meet and remember what it is to yearn again. Though it’s told primarily from the man’s point of view, the woman provides us enough insight that it’s clear she’s just as troubled and lonely as he is. There’s a beautiful ambiguity draped over every inch of “The Black Dog.” As the story progresses, you nearly want to race through every sentence to unearth the revelation that will hopefully explain the very odd circumstances in which these two people have found each other. A meal at a restaurant to a night walk across a bridge to sitting together in the woods – it’s a first date many would be consider to be ideal…except for that ominous idling van, of course. By my nature I’m attracted to things with a certain kind of sad beauty. It’s a reason why I love the works of Norman Partridge, and it’s also why I’ll certainly be checking out more work by Laird Barron, as well. Still, it might just be the most horrific statement in the entire book…because it’s absolutely true. This tale breathes life into the scarecrow legend of Halloween, which may or may not be rooted in historical lore. 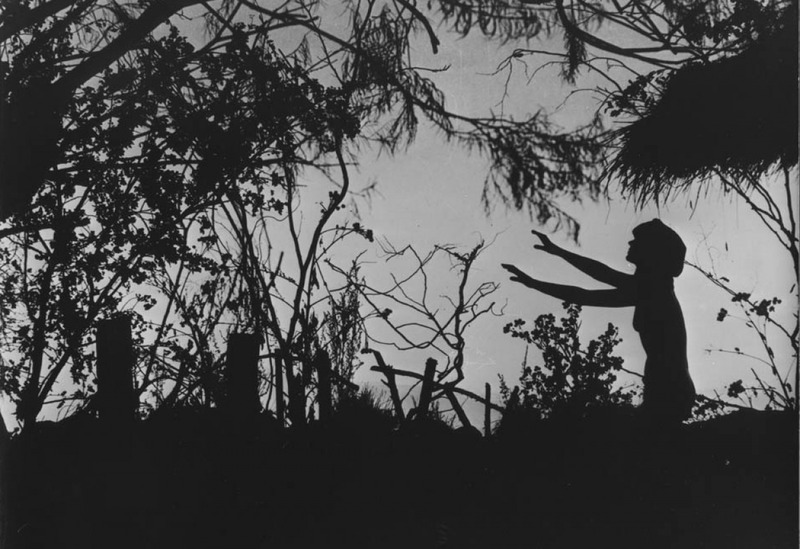 The scarecrow has been associated with Halloween for a long time, and Hodge’s story concocts a perfectly appropriate scenario as to why. Every year on Halloween night, in the town of Dunhaven, townspeople gather objects that symbolize the dearly departed in hopes that, if left as an offering, the spirit of their deceased loved one will fill the scarecrow and share a message with the bereaved. Many townspeople vie yearly for this chance, and among them for the first time are Bailey and her young son, Cody, who wishes to see the resurrected spirit of his father, Drew. Also hoping to see the return of a loved one is a young woman named Melanie, whose sister, Angela, went missing several years before and was never found, so was presumed dead. I rather liked this story, as it reinforces the idea of “maybe it’s better not to know.” Cody is eager to ask his father about the afterlife and what the “rules” are, while Melanie wants to ask Angela who was responsible for her disappearance and death. The story’s themes are open to multiple interpretations, but I prefer to think that existence, as we know it, is so terrible – lacking actual humanity amongst its humans – that the dead don’t so much as choose to come back as they’re forced to. As you can imagine, I’m really fun at parties. These aren’t the only stories in the collection worth a read, but they were my personal favorites. Halloween: Magic, Mystery and the Macabre, as they say, has something for everyone. 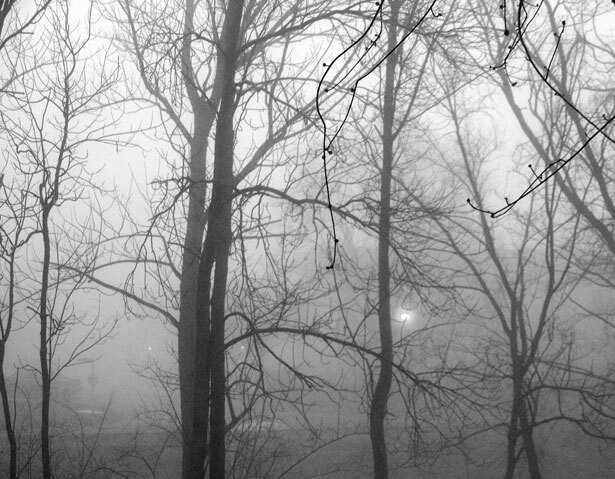 I’m personally drawn toward the dark and bleak, and so stories of that nature were my own highlights. But the book celebrates every kind of genre and approach – real history is intertwined with lycanthropy; real international conflicts are explored through themes of cults, insanity, and vampirism; some stories are quirky, some are anything but. My one real complaint about the anthology (and it’s one I often have with Halloween anthologies) is that while many of the stories contain Halloween elements, they’re not actually about Halloween in any way. Werewolves and vampires are fun and all, but their only ties to Halloween are that they’re spooky and monstrous, and so is Halloween, and so therefore, a connection. However, I can’t in good conscience say any of these stories are poorly written because they’re not; they’re just not entirely what the title promises. Still, I recommend Halloween: Magic, Mystery and the Macabre. The book itself is nice and weighty; its girth confirms you’ll be getting a lot of bang for your buck. It’s not quite as large as, say, October Dreams, but it’s certainly one of the larger anthologies out there that (mostly) celebrates this time of year. Another one from the Halloween shelf, and it’s delightful: a collection of photographs from Halloweens past, showing people in their costumes in the midst of October pageantry. Some are eerie, some are cutesy, and some make me yearn for decades long gone where Halloween was celebrated in a purer way. I’d been doing this already for years: scavenging Internet for old photographs of people in their Halloween best. Turns out I could have just bought myself the danged book. The photographs in “Haunted Air” provide an extraordinary glimpse into the traditions of this macabre festival from ages past, and form an important document of photographic history. These are the pictures of the dead: family portraits, mementos of the treasured, now unrecognizable, and others. The roots of Halloween lie in the ancient pre–Christian Celtic festival of Samhain, a feast to mark the death of the old year and the birth of the new. It was believed that on this night the veil separating the worlds of the living and the dead grew thin and ruptured, allowing spirits to pass through and walk unseen but not unheard amongst men. The advent of Christianity saw the pagan festival subsumed in All Souls’ Day, when across Europe the dead were mourned and venerated. Children and the poor, often masked or in outlandish costume, wandered the night begging “soul cakes” in exchange for prayers, and fires burned to keep malevolent phantoms at bay. From Europe, the haunted tradition would quickly take root and flourish in the fertile soil of the New World. Feeding hungrily on fresh lore, consuming half–remembered tales of its own shadowy origins and rituals, Halloween was reborn in America. The pumpkin supplanted the carved turnip; costumes grew ever stranger, and celebrants both rural and urban seized gleefully on the festival’s intoxicating, lawless spirit. For one wild night, the dead stared into the faces of the living, and the living, ghoulishly masked and clad in tattered backwoods baroque, stared back. Haunted Air is a cool little book, and almost feels like it should be the official keepsake of Halloween, including its domesticated history. A large part of the appeal I hold toward Halloween is nostalgia-driven. I feel like I can remember every single year when I went out trick-or-treating, or the details of every party I attended, or what I spent every year doing with friends or girlfriends. It’s almost like an unending circle: Halloween is my favorite night of the year, and so I want to spend it doing the things I love. Those things live on in my memory and contribute to the fondness I have for Halloween in the first place. There’s not much else that I can say about Haunted Air other than it provides a time warp back through your entire life, not just the costumed caperers in the photos. 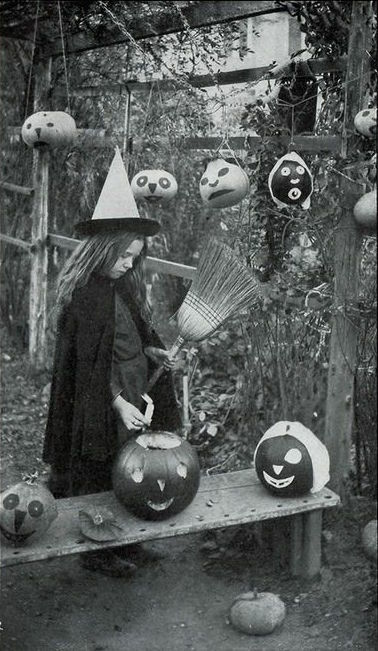 Every significant era of Halloween’s American history is provided in the book, so no matter what your age, at least part if it will easily trigger something in you and make you recall that specific time in your life – whether good or bad. Keep it out on your coffee table so that during the month of October, as you’re passing by, take a minute to flip through a couple pages and enjoy the mini-trips to Halloweens past when life didn’t seem so complicated – and when all that mattered was on the page, forever preserved by a single snapshot.